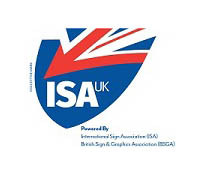 Welcome to the BSGA - The British Sign and Graphics Association. Since 1918 the BSGA and its forerunner organisations have been representing the interests of all businesses associated with the sign industry. BSGA members include all types of sign manufacturers and suppliers from small businesses focussing on one-off sign making to large companies specialising in digitally produced signs. And it’s not just Sign Makers that we represent, the BSGA is also the association for number of other sign related sectors like sign designers, consultants, installers and suppliers of signage materials. 1. To lobby, represent and support on behalf of members. 2. To encourage and promote the very best quality and standards available in both workmanship and customer service. 3. To gain recognition for and promote the services of all of our members. Please visit our website now for more information about becoming a member or the services we offer, alternatively you can call us to discuss any questions you may have.